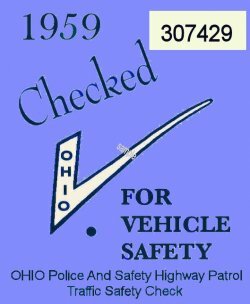 1959 Ohio Safety Check Inspection Sticker - $20.00 : Bob Hoyts Classic Inspection Stickers, Add a Final Touch to your Restoration! Ohio had a form of statewide inspection as far back as 1937. This sticker proves there was some sort of inspection when a car tax was paid for registration, the car was inspected for safety. This 1959 sticker was issued when a roadside inspection turned up bad equipment. For an additional $10.00 we can remove the serial number and replace it with your license plate number.